You’re probably familiar with a classic seven layer dip, the one with salsa, refried beans, and guacamole, right? It’s good! 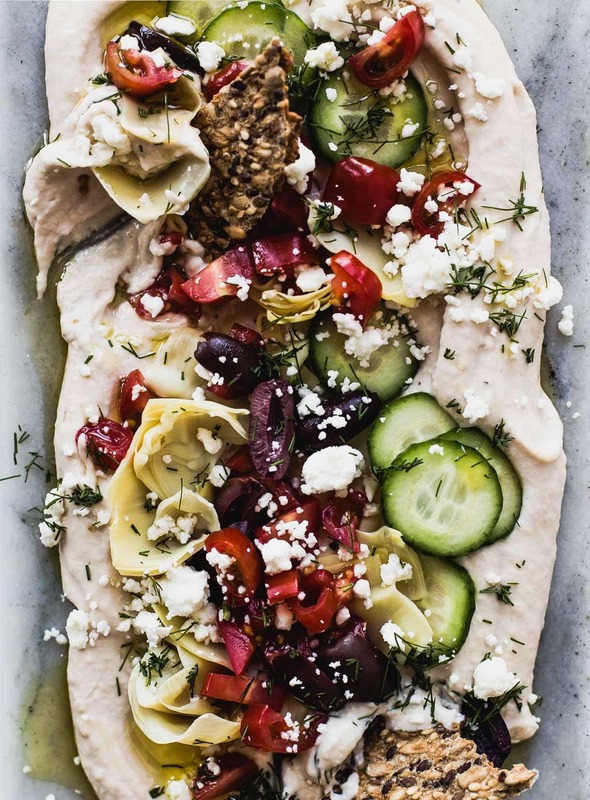 But I was looking for a fresh twist, when I found this Mediterranean hummus version in A Couple Cooks new cookbook, Pretty Simple Cooking (more on why I love the book below). It’s everything I was hoping for. Colorful, flavorful, and wholesome. 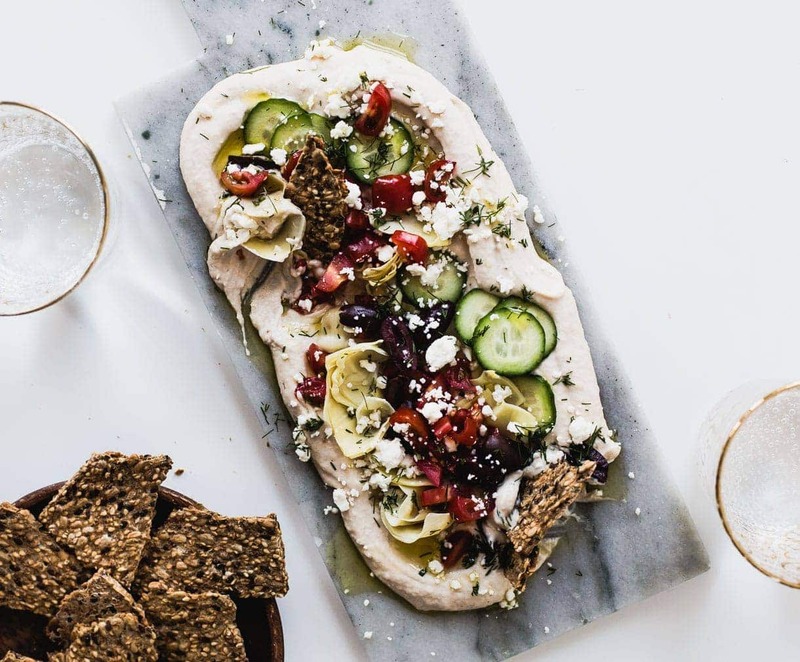 The layers are scattered atop my favorite white bean hummus, but you can definitely use store-bought to make this the quickest appetizer you’ve ever put together. The different components add something special to each bite. 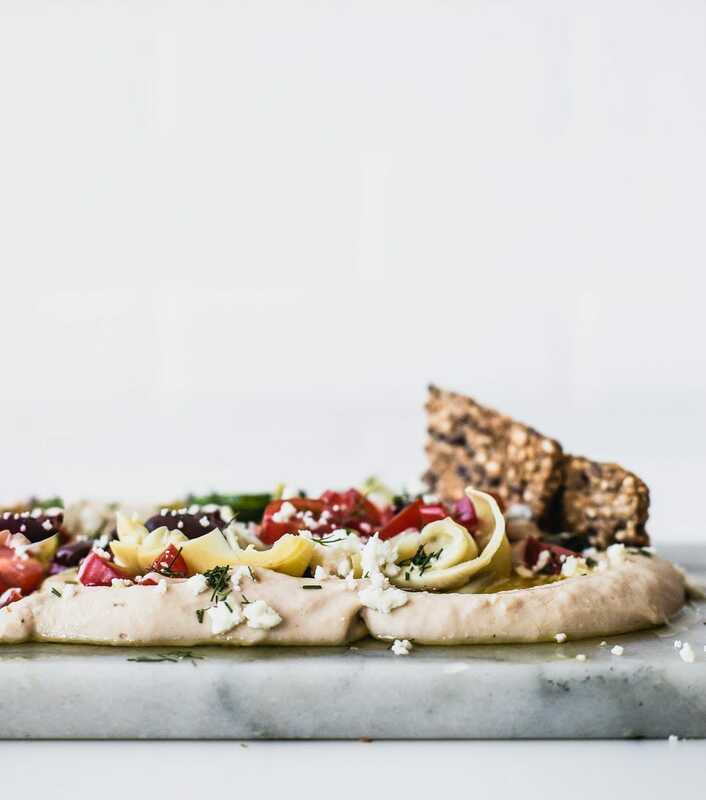 I choose to make this an abstract platter by spreading the hummus onto this marble slab, but if you’re taking this to a party, it transports well in a simple glass dish. And feel free to make this your own, or use it as an opportunity to use up the few bits of produce hiding in your refrigerator! To fit my likings, I left off the red onion the original recipe called for, and swapped dill for parsley because I like its brightness. I met Sonja (Alex being her husband) of A Couple Cooks a few years ago at the Eat Sea Retreat in California. We made an instant connection, as I found out she was a Minnesota girl, born and raised. 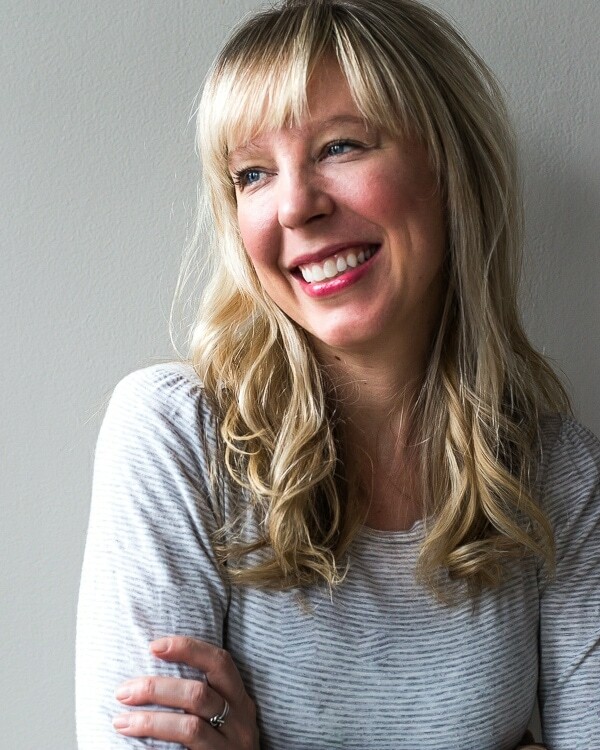 Her and Alex now live in Indiana, with their beautiful son Larson (whose adoption story is incredible), and their blog + podcast have been instrumental in teaching so many people around the world how to cook real food, and love the process while you’re at it. 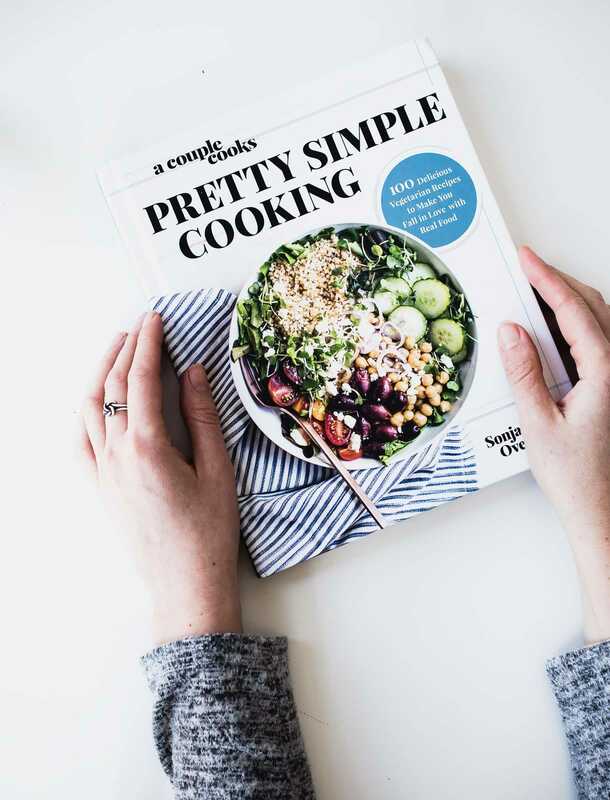 Pretty Simple Cooking is not only filled with 100 nourishing, vegetarian recipes, but also ten lessons sprinkled throughout that inspire a love for home cooking. Their philosophies resonate deeply with me…. that good food doesn’t have to be intimidating or difficult, but it isn’t always fast, like so much of our culture preaches. Of course I love shortcuts and convenience as much as anyone, but I also spend much of my time in the kitchen because I love the feeling of creating to nourish. To make something with my own hands, that made its way there because of someone else’s hands (the farmer, artisan, or maker). And to spend time with others gathered around food. You can buy the cookbook HERE, or enter the giveaway to have it to delivered right to your door! For your chance to win, sign up for my email list HERE or enter on Instagram HERE, for new recipes and giveaways. One winner chosen on Saturday, February 10th, 2018. This recipe is lightly adapted from the Pretty Simple Cooking cookbook, by Sonja and Alex Overhiser. 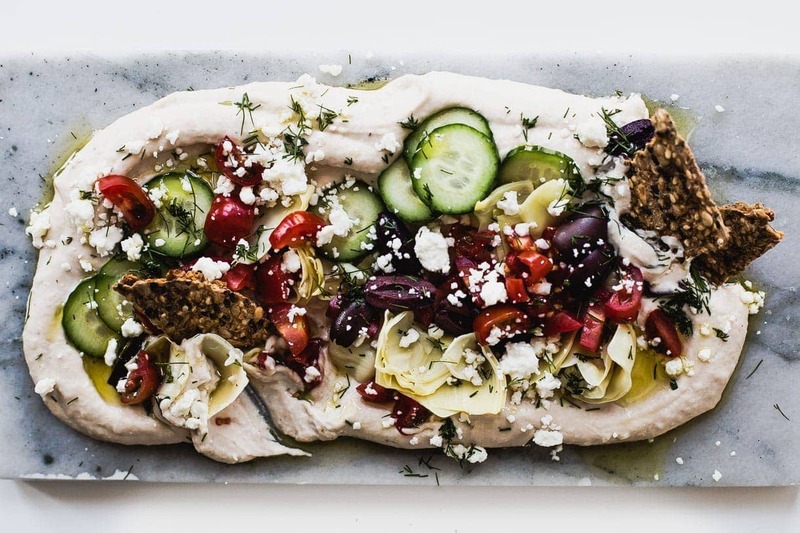 Spread the hummus on a large plate and top with cucumber, tomatoes, olives, artichoke hearts. Sprinkle with feta, and drizzle with olive oil. Signed up for the mailing list. Love following along with what you’re doing, looking forward to more! Oh my goodness, THANK YOU, friend! You absolutely understand the heart of Pretty Simple Cooking and that’s something I hope others will leave with as well. It’s not always quick or 5-ingredient, but it can be pretty simple! Your photos are GORGEOUS. And I think being Minnesota gals, we’ll always have that sister connection, right?! I think back to Eat Sea Retreat and my heart is full to have been able to cross paths and now cheer each other on virtually and in real life. Can’t wait to see you very soon. So inspiring , so vibrant and healthy ! Thank you so much !